The Science Council visited the Medical Research Council’s (MRC) site at Harwell on 6 October 2016 to present them with their Employer Champion plaque. Employer Champion status recognises the MRC’s commitment to championing the values of professional registration and supporting their scientific staff through the registration process, for those who are eligible, as well as recognising staff who become registered. The Medical Research Council improves human health through world-class medical research. They fund research across the biomedical spectrum, from fundamental lab-based science to clinical trials, and in all major disease areas. Their research has resulted in life-changing discoveries for over a hundred years. 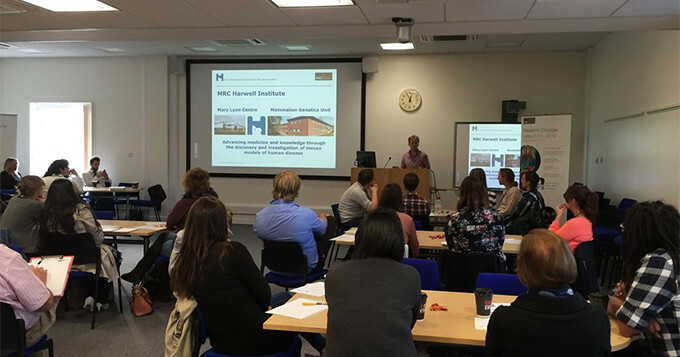 During the day we heard from Mark Gardiner, Facilities Resource and Training Manager, who talked through his career to date and explained how taking responsibility for the progression of his career, with the support of the MRC, had made him feel empowered. The Science Council ran a workshop designed to encourage delegates to think about their proudest professional achievements and the challenges they had overcome to attain them, and a presentation from HEaTED explained the value of CPD and how to find opportunities to undertake it. The day concluded with the presentation of the Employer Champion plaque to Linda Holliday, Deputy Human Resources Director at the MRC.